The mission of Mile High Youth Corps (MHYC) is to help youth make a difference in themselves and their community through meaningful service opportunities and educational experiences. 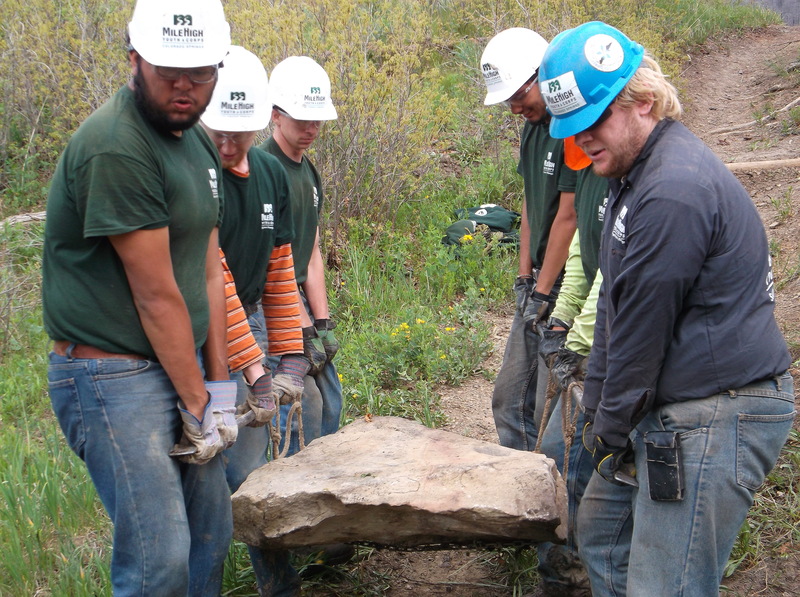 MHYC employs young adults, ages 16-24, on conservation projects in neighborhoods, public lands and open spaces throughout the Southern Front Range and Metro Denver. We have a 24-year track record of engaging youth in jobs that help the planet and provide pathways to a promising future. By integrating paid work experience on community projects with career exploration, education and life skills training, the Corps helps youth gain the knowledge, skills, and motivation they need to make positive changes in their community, their own lives and the world. 7:00 am. : Shouts of ‘Good morning!’ and ‘Hey!’ ring out as crew mates arrive at our worksite. The morning air is crisp and clean in the Royal Gorge, it’s shaping up to be another beautiful day for trail building. 7:15 am. : The crew leader calls a safety circle together, something we do at the beginning and end of every day. One by one, each crew member leads a stretch and gives a reminder about a safety hazard we may see today, and how to avoid it. Once everyone has gone, we grab our tools and hike up to where we left off yesterday. 9:00 am: The trail we have already dug is looking superb, and the crew is getting excited about how the project is coming together. It looks like hikers and bikers are going to be enjoying our trail for years to come. Our crew leader explains the goals for the day and splits us into pairs, we find our sections and start working, easily falling into the process of cutting into the hill, flattening the walking path, and stabilizing the outer edge. 12:00 pm: Lunch time! We find a shady spot on a nearby slope, and sit down to rest and enjoy our meal. Among the usual lunch item trades, today we’re also swapping jokes and weekend plans. Spirits are especially high because this afternoon we’re having an education session, something we do every week, when trail building stops and we focus on learning something new. 1:00 pm: Today’s education session is on wilderness survival, important skills to have for any adventurer. For the rest of the day we practice reading maps, using compasses, and building emergency shelters. 3:30 pm: It’s been a spectacular way to end another week of hard work. We’ve accomplished our goals and our crew is beaming with pride at everything we’ve done for the outdoor enthusiasts of Cañon City, Fremont County, and the rest of Colorado. We say our goodbyes and head off, knowing that Monday morning, the crew will be eager to hit the trails again. To apply for a position with Mile High Youth Corp- Southern Front Range, please visit milehighyouthcorps.org/apply-now. Or, call us at 719-630-7421 for more information. Posted in Southern Front RangeTagged AmeriCorps, Colorado Springs, Conservation, Corpsmembers, Mile High Youth Corps, Royal Gorge, Southern Front RangeBookmark the permalink.